For the last few weeks, over a month even, I’ve been waiting. Waiting for just the right time. The right time to look over my shoulder, check nobody is watching and pick. Pick wild garlic to be precise. I’ve been running past it, detouring to take a peek and willing it to come up as it’s such a proper bounty. And today, there it was in glorious flower en route to the first Farmers’ Market at Forty Hall Farm. Finally a proper farmers’ market in my hometown! I have been waiting years for this market. There is apparently some old decree in my hometown that prohibits my local farm holding a market on the weekend as it competes with another in town. I’m not really sure how this decree has been overcome – do share if you know – but I’m ever so glad because it now means we are properly hipster. We have a farmers’ market. Our teeny, tiny, non trendy town of Enfield in North London has a cool foodie haven once a month. This is very exciting! My husband and I had a good wander round stopping to say hello to local traders and making time to chat to new ones to make them feel at home and make sure they come back! After all we want to make sure that they get good trade and that this market continues. It was a wonderful way to spend a morning armed with inspiration and produce to make lunch. So back to my wild garlic. There really is an abundance so if you’re local to me,do pop by and have a good forage. It’s all just near the walking path off Clay Hill near the Rose and Crown Pub. I picked just enough to make a small batch of wild garlic pesto. Careful to pick from different bunches and not too near the path I came home with fingers stained green and smelling fabulously of garlic. Now I’m not a fan of pesto with cheese. I find it too rich and heavy and also less versatile. My pesto is simply made with washed wild garlic leaves and the tender parts of the stem, toasted sunflower seeds, extra virgin olive oil, lemon and salt. I guess it’s more of a sauce than a pesto then. The ‘recipe’ is a loose one which barely merits faffing around with the recipe widget. Add more or less of whatever you like. I often us pumpkin seeds, butternut squash seeds, walnuts, brazil nuts, almonds – whatever is around. What I do try and do now though is activate the seeds. I recently met Nick Barnard of Rude Health. I loved his ethos so much that I bought his book called Eat Right and this was the first I had read about ‘activating’ seeds and nuts. It simply means to soak them in a saline solution in order to break down the phytic acid and enzymes that prevent us from absorbing most of the nutrients. If you leave them long enough they’ll sprout in some cases. The Holistic Ingredient blog does a much better job of explaining what activating is and how long you need for different varieties. Better still, buy Nick’s book as this is just one of the fascinating things he talks about. I didn’t have the patience to leave them too long. I drained them, patted them dry and then toasted them a little to release their flavour a bit more. Then they went into the Magimix with the other ingredients and boom! Delicious pesto, sauce, dip or whatever else you want to call the luscious green stuff. Wash the wild garlic leaves in plenty of cold water and then shake the water off in a salad spinner. Do this a few times to make sure you get rid of any teeny, tiny bugs and the like. Pop the leaves in a mixer or a pestle and mortar. Add the rest of the ingredients and blitz. Add salt to taste and blitz again. Check for more oil or lemon or salt and blitz again if need be. POur into a sterilised jar and keep in the fridge. Now I love pasta and there is nothing better than slurping tagliatelle, linguine or spaghetti with this pesto. It has to be done at least once when you’ve made a batch. But there are sooooo many other ways to enjoy this. 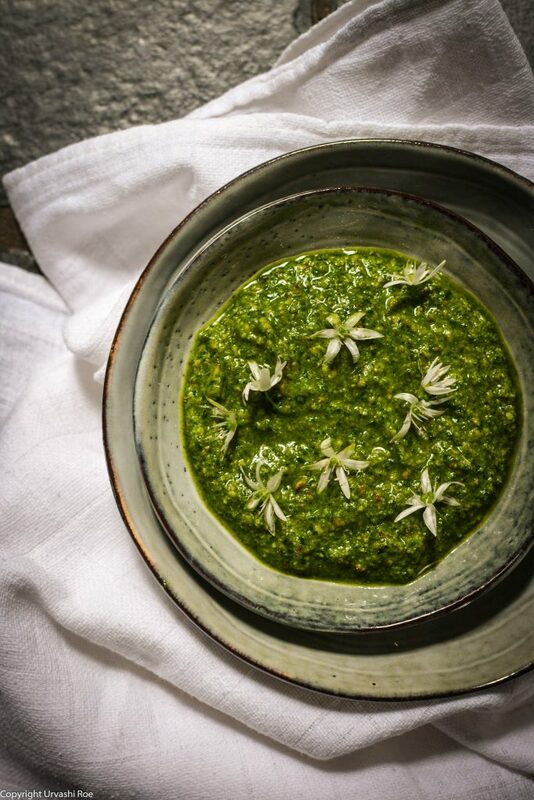 Wild garlic season happily coincides with Pembrokeshire Early and New Potato season so all you need to do is boil them up, crush thema tad and then stir this pesto through. Use it like thai curry paste as a base for steaming veg. Add a big dollop to a wok, add about a tablespoon of oil and half a cup of water. Stir and place over some purple sprouting broccoli. Cover and leave to steam for about 5 mins til the stems are just tender. Toss the liquid through lightly and you’ll have wonderfully flavoured veg. This also works with asparagus which is also in season now. Stir it into yoghurt or hummus and use as a dip for late night peckishness of crisps and wine = you know. THAT time on a Sunday night when you get the nibbles. Spread it on toast and then top with a fried, scrambled or poached egg. Stir it through lemon risotto right at the end for a little spring kick. Drizzle over and serve hot with more toasted sunflower seeds. Work it into your bread dough so you get lovely twirls of it as you break the bread apart. Spoon it over a ball of mozzarella or burrata and eat with a side of blood oranges (just still in season) or tomatoes. Drizzle it over dhal for an unusual and subtle garlic twist. So there you have it. I hope you’ll have a go. Let me know how you end up using it! Pop over to my Instagram as I’ll be posting more ideas on there as I use up this jar. Sounds delicious, it must be particularly satisfying to make something so tasty with ‘free’ ingredients! My husband has now got an allotment and is growing LOTS of chicory, any recommendation what to do with it please ? Yes indeed. Very satisfying. I love foraging. I’ve been eating the hedge garlic and that’s lovely too but a lot milder. Beautiful garlic flowers for garnish. I love my allotment! Is he at Clay Hill? I’ve never grown chicory before but it’s lovely as a vessel for dips. I had it once with bagna cuda. I guess this pesto would be a nice dip for chicory too. Perhaps stirred into a bit of yoghurt. Because it’s so bitter it’s really nice with sweet stuff. Pear, chicory and blue cheese salad with walnuts. Or fig and chicory works well too. Ooooh I need to grow some chicory I think! Ha ha! Ok no problem. There is loads along the path towards forty hall round the back of the allotments. This looks stunning, thanks Urvashi – will definitely be giving this a go! Thanks! It’s such a beautiful colour! 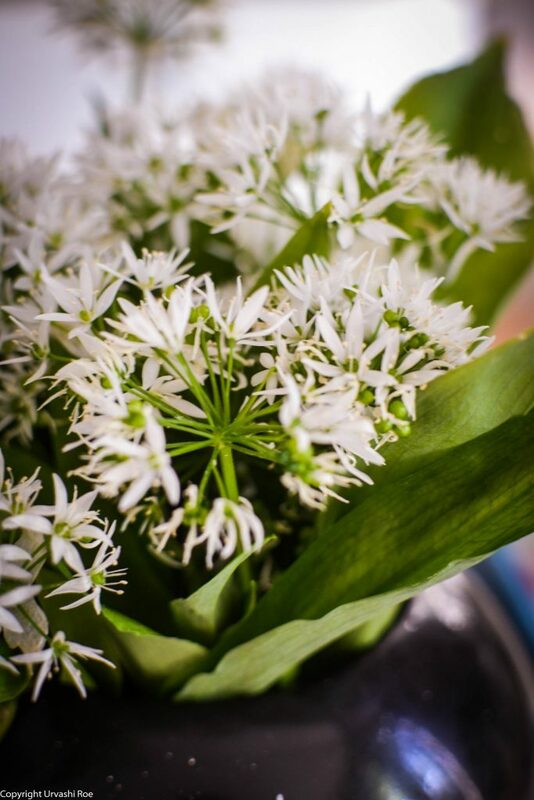 Absolutely adore wild garlic – both the scent as you walk through the woods and the incredible taste. I agree a simple pesto is the best thing to do with it. And you have a farmers’ market! Our local, organic farmers’ market enriches my life in so many ways. It’s now closed as it’s the fallow season and I’m missing it dreadfully. Get my fix when I’m in the UK – usually in Stroud (one of the first ones to be founded). I’m going to try the market in Walthamstow. Far trendier than Enfield and on every week.